Although not among the famous Twelve Labours of Hercules, the killing of the giant Antaeus was one of the most formidable adventures of the mythological Greek hero. Antaeus, the son of Poseidon and Gaia, lived in the deserts of Libya. He killed by-passers and collected their skulls, to build out of them a temple to his divine father. Antaeus was immortal while touching the Earth -his mother- but lifted into the air he became as vulnerable as any ordinary man. 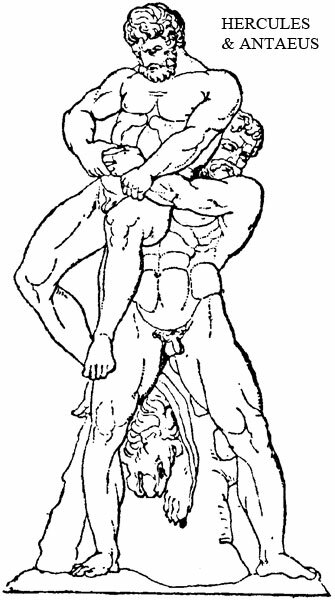 Hercules discovered the secret of the giant's power and, holding him aloft, crushed him in a bearhug. According to the Greek-Roman historian Plutarch, the giant Antaeus was 60 cubit (26 meter, 80 feet) tall. Plutarch reports that the Roman commander Quintus Sertorius discovered Antaeus's bones during an expedition to Tingis (Tangier, Morocco) in ca. 81 BC. Nothing is said in the legends on how a normal-height hero as Hercules managed to hold Antaeus into the air in order to kill him. We may assume that by virtue of some prodigious transformation -probably performed by command of the hero's almighty father Zeus- Hercules temporarily acquired a height similar to Antaeus's. The following images portrait Hercules in his newly acquired height, and his lover Iolaus... who in the meantime remained just a normal man. I love the picture of Antaeus at his lover's lips- what a great image- a kiss by your giant lover. Wonderful work. Love this series of mythological giants. Oups… I wanted to say that your work is fabulous, as always! HOT HOT HOT post! Though it would be hot to see a giant Hercules walking though the city, with the crowd gasping at his immense size. This just needed more hot shots. It leaves me wanting more. Love your work! When are you going to post more? Can't wait to see you continue. GREAT WORK! When is the next installment? I love seeing giants dominate groups of men, great work!